I don't know the yarn or the pattern but I do find it's very very rare that my intuition is out on knitting projects. If it's not feeling right, frog, I say. I think it looks lovely, and I much prefer the drapey look compared to the Wollmeise version. It does look like something that will be much prettier once blocked too. Sorry, I wish I could tell something useful about your thread, but unfortunately I have no experience. I wonder how it goes from here. The blocked one in your link looks fabulous - almost ethereal, yet when on needles looks very similar to yours. I wish I could knit as quickly as you do!! However, as with others who have commented, if your heeart isn't in it, you may find it difficult to continue. Can you contact the person who did the shawl and see what she says? martinaaaa! her patterns are the best! I think keep going, I'm sure it will be lovely and airy! It will definitely look better when blocked. Thin yarns always look better when when all the stitches are straightened up. I agree with Adrienne, it does look rather similar to the unblocked version in your link. But I also agree with all the other comments, there is nothing worse than getting to the end of an extensive project to feel that it could have been different and then not to use the item because you aren't completely satisfied. Go with your heart on the matter! I have to admit that my gut never lies when it comes to what it is going to look like when finished. I also don't like knitting items I am unhappy with. I'd carry on - blocking is miraculous. We can't get Wollemeise here either. I'm still kicking myself for only buying two skeins when I was in California las year. I think it looks wonderful and can not imagine frogging it. I have never used Wollemeise either, but have plans to one day. It looks lovely and with a bit of blocking it should be more to your liking. I also think it will look lovely once it is washed/blocked (and much better than in a thicker yarn). 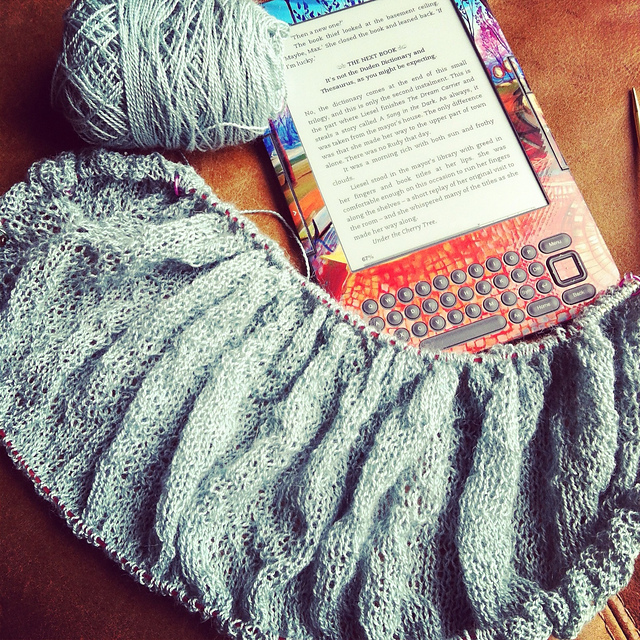 But if you are bored of knitting it, perhaps a little hiatus will make things look better. It's so hard to tell before blocking, but I think it'll be lovely. I agree with most and say keep going! The one you linked to looks so much like yours on the needles/close up picture and the end blocked picture is GORGEOUS! I don't know why two circs are called for but I think using just one is sufficient. Good luck and go w/your gut. Thanks for all your comments - I decided to knit on - it's actually starting to look much better and as it's such an easy knit and weighs next to nothing I'll keep it doing and will work on it over the summer when we're on holiday. In the meantime, I'm also staling for some nice Wollmeise lace-garn.